The Pros and Cons of this Carrera Vendetta Mountain Bike. 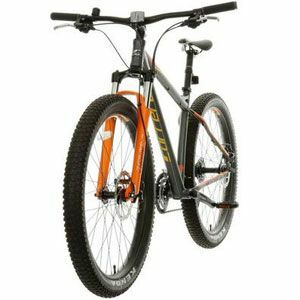 There is a lot in the specification that will encourage riders to take this Carrera Vendetta Mens Mountain Bike further. The feature that stands out the most on this bike is the wheels. 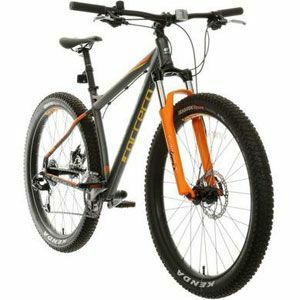 This Carrera mountain bike has a massive set in regard to both the wheels themselves and the tyres that were included. There are 27.5’’ wheel with plus side 2.8’’ tyres. This takes the Carrera bike closer to 29er territory and should help to improve the control and response of the bike on rough ground. If that wasn’t enough, the wheels are quick-release so that riders can disassemble the bike and transport it to the trails more easily. It isn’t just about the wheels with this specification. This mountain bicycle is built for fast responses and high-speed adventures. There is a lightweight aluminium frame so users don’t get weighed down, a 24 speed SRAM gear system and Tektro Novela disc brakes for quick braking. Users also say that the gear changes are smooth too, adding to that effortless feel. This doesn’t mean that the Carrera Mens Mountain Bike couldn’t use some upgrades here and there. There are still some buyers that have some criticisms to make about this bike. There are mixed comments about the saddle. Some say that it is far too hard while others get used to it pretty quickly. Then there are those that say that the pedals don’t match the style of the bike and some of the smaller components are a little flimsy. This has led to the suggestion that it is too focused on the tyres and a little overpriced. What does this all mean for a final recommendation on this Carrera Vendetta Mountain Bicycle? There isn’t much to say against this model when you weigh up the performance against some of the smaller issues. There are aspects of this product that could be improved in the future – such as the pedals and the saddle. But, this may only increase the bike further. Many riders are happy to overlook the little flaws because of the way that this product handles itself out in the countryside. The tyres really are just the starting point here. The Carrera mountain bike is attractive, responsive and fast enough to impress experienced riders. Find more reviews about the Carrera Vendetta Mens Mountain Bike on Halfords here.